Playing Doki Doki Literature Club is like realising you have a fever: For a while you deny the creeping feeling that something isn't quite right until it's too late to do anything about it. In the beginning of the game you think it's a cute dating sim, but before too long, you can no longer deny that you're playing a horror game. While the latter half of the game is scary as hell, one of Doki Doki Literature Club's most impactful moments happens before its turn to horror. In Doki Doki Literature Club, you're the protagonist of a visual novel about an after school club where the members read books and write poetry. You read three poems from each character, which give you some insight into their inner world. Yuri is quiet and melancholy, so her poems are purple prose-y and contain complicated metaphors. Natsuki's brusque nature is reflected in her short, taut writing. Monika's writing is disarming and sinister. Sayori's writing is the most interesting of all the characters. Her first poem is a silly and disorganized one about being hungry for breakfast. Her second poem is when I first realised that this game was going to go to some very dark places. Sayori's poem "Bottles" depicts some disturbing feelings she has about herself. She describes taking her happy thoughts out of her head, storing them in bottles, and then sharing them with her friends. Eventually her friends stop wanting her bottles, and they end up smashed on the ground. Sayori tries to find more happy thoughts, but she doesn't have any left. This poem happens long before the game starts glitching out and the characters started talking to the player instead of their character. Given that the game opens with a warning about its dark themes I knew scary things would come eventually, but "Bottles" was more sad than scary. Sayori describing being unable to stay happy seemed to me like a pretty clear symptom of depression, but Doki Doki Literature Club doesn't give the player or Sayori the tools to be able to deal with it. In a lot of romance visual novels the object of your affection will have an emotional problem you have to help them solve. Sometimes this problem is depression. Sayori's poem feels heavier than a romance trope that can be solved with the power of love. The realism of Sayori's mental health problems is unsettling, especially because at this point, other than "Bottles," the game still feels like a cliché light dating sim about cute anime girls. 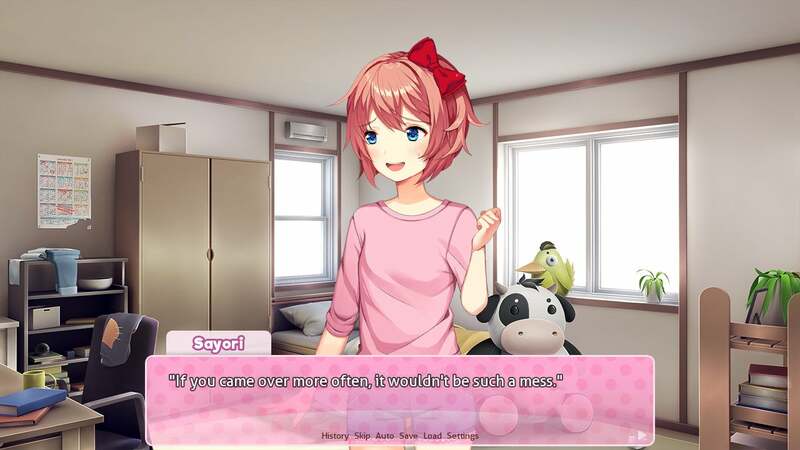 Later in the game, while you're getting ready for the school festival with the other characters, you can't help but remember that Sayori is struggling with something more significant than recruiting new club members. Doki Doki Literature Club makes it pretty clear when you're past the point of no return. Sayori's next poem begins with the phrase "get out of my head" repeated dozens of times, and from there the game starts outright messing with you. By the time Sayori tells the player character that she's severely depressed, she's clearly teetering on the edge of a breakdown, tearfully confessing her love for the player character. Even if you say that you love her back, her mood doesn't improve. In fact, her inability to be happy that her crush is reciprocated makes her even sadder. "Bottles" feels indicative of what the game's developer Dan Salvato meant when he called the game's events "an inevitable tragedy." 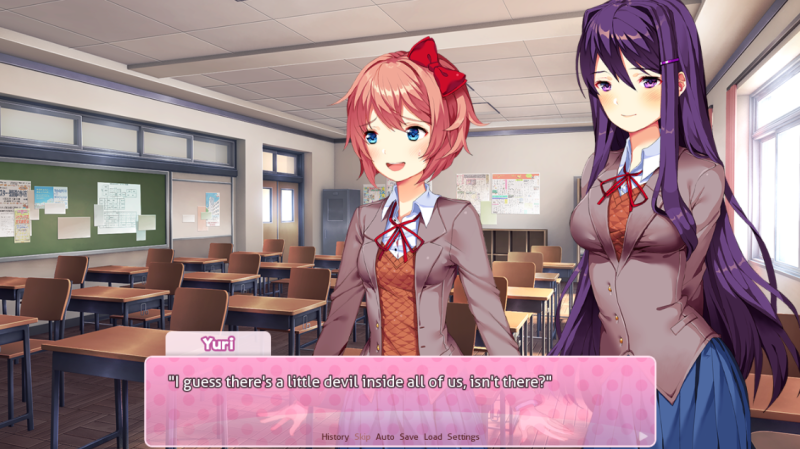 By its second day, before the game gets aggressively weird, you know that something is wrong with Sayori. I got really attached to her character when I first played, seeing a little of my confused, sad teenage self in her. I think I also knew I couldn't save her, but I tried not to think about it until it was too late. 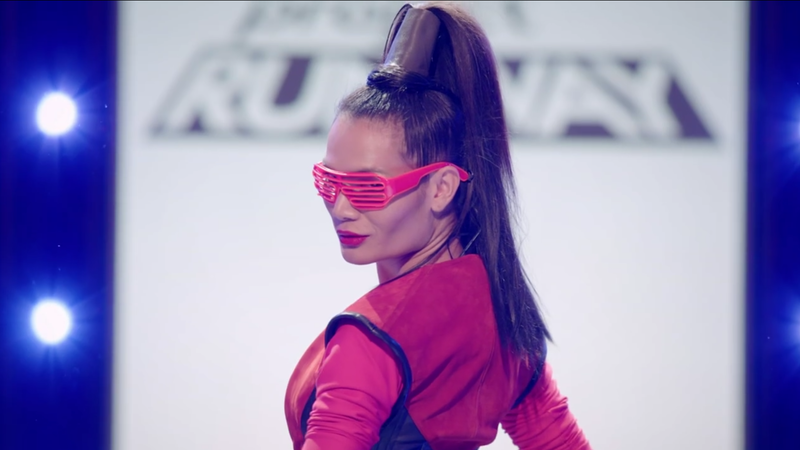 Gotta love the spoilers before the jump. Sounds like I probably would've been interested in this game. Ah well. Mate, it's really a minor spoiler. The game gets much more interesting after this and does some really neat stuff that you should check out. As the article states, "given that the game opens with a warning about its dark themes" it should be fairly self-evident that "scary things would come eventually". Sounds like the game "spoils" itself for you the minute you boot it up. Still, I imagine that you will recover quickly enough from your first world problems. Sayori just wants to hang out with you.